Finding therightsoap for sensitive skin can be difficult if you are not sure what to lookfor. Soap can have many additives that can further irritate sensitive skin, or strip away the bodies naturaldefensesystem, (oil, moisture) leaving the skinhypersensitive. Sulfates: Sodium Laureth Sulfate: (SLS) is probably the most commonly used additive in skin care as a foaming agent. Not only is it used in skin care, but it is also used in industrial cleaning products, like floor cleaners and engine degreasers. Although we may like this foaming feature; the problem is it has many downsides. SLS’s damage cell membranes and when used over time cause the skin more irritation, damaging pores further increasing acne breakouts. Triclosan: Triclosan is an ingredient used in many soap products as an antibacterial and antifungal. However, when it comes in contact with the skin, it stays there for many hours, leaving adequate time to absorb deep into the skin. Triclosan is similar to a pesticide and can cause serious health issues, including damage to major organs, endocrine disturbances and accumulated buildup in the body, causing contaminated breast milk and sensitivities. Parabens: Parabens are used as preservatives to prolong the shelf life of a product. Parabens have been shown to mimic the action of the female hormone estrogen, which can encourage the growth of human breast tumors. Undoubtedly something to avoid in your skin care products. Synthetic colors: Most synthetic colors contain heavy metals like coal tar which is a known carcinogenic. These metals leak into the skin and cause skin irritations and heavy metal buildup in the body. Synthetic fragrance: Another endocrine disrupter that mimics hormones and may alter genital development. Synthetic fragrances are listed as phthalates, so be sure to look for phthalate-free products. Buying local, natural soaps can sometimes be the best option when trying to avoid these harsh additives. I also recommend buying your soap from reputable distributors like The Detox Market, that have informative descriptions, customer reviews and a full list of ingredients available. 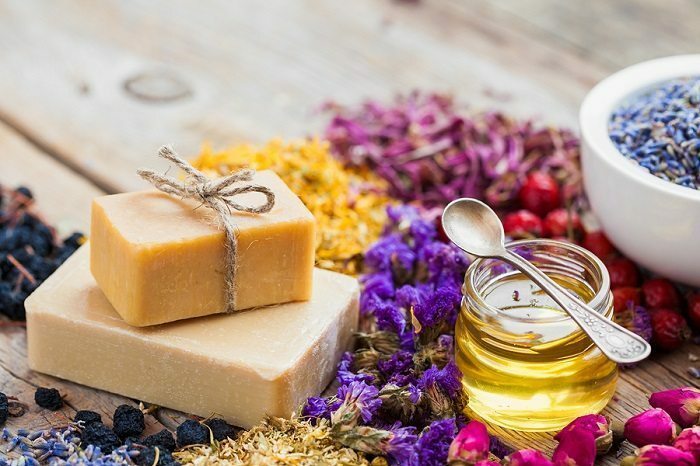 Now that you know what ingredients to avoid, we have provided a list of ingredients you want to look for when choosing a soap for sensitive skin. Almond oil: This oil is very gentle on sensitive skin and will not clog the pores. Almond oil is healing and high in Vitamin E, very hydrating and will help prevent eczema breakouts. Aloe Vera: Aloe helps cure cuts, burns and minor abrasions, its a thick gel that contains anti bacterial, pain inhibitors, coagulating agent, anti-inflammatory, scar reducing properties, and other vitamins, which stimulate cell growth and boost your body’s immune system. Manuka Honey: This honey in particular is amazing for sensitive skin, it draws impurities, toxins, and bacteria from the pores. It contains lactic acid, which gently exfoliates and resurfaces. Lavender: Lavender is an essential oil dedicated to helping sensitive skin. it is a powerful anti-inflammatory that speeds healing time and prevents scaring. It soothes and calms irritated skin quickly. Tamanu oil: An anti-inflammatory oil, helping in skin conditions such as acne, rashes, and most other irritation brought to the skin. This can include, insect bites, sores, and eczema. Tamanu oil is also very effective on acne scars. Activated Charcoal: The super absorbent and anti-bacterial properties are the main reasons why activated charcoal is the best ingredient for tackling acne, rashes, irritation and pimples on your skin. Washing with a nutrient rich soap is just as effective on sensitive skin as other gels or foam cleansers. Soap is affordable and will last a long time. 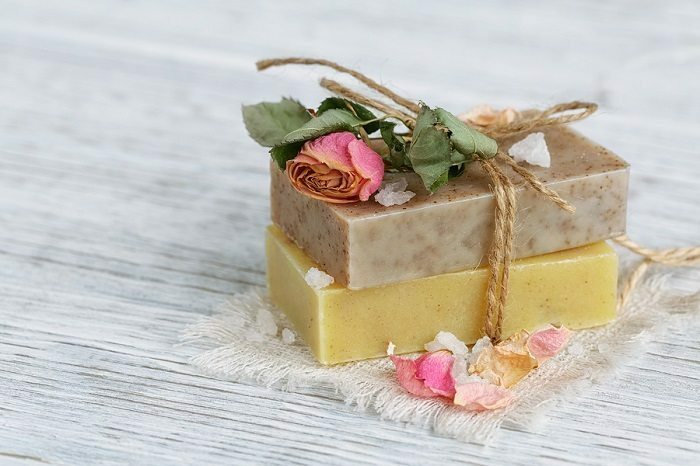 When you follow our guide and buy soap with some of the ingredients listed above, you will help soothe sensitive skin without further drying it out or irritating it. Like our article? Share with your friends or leave us a comment! Previous articleCosmetic Questions: Is Water Just a Filler?